I have come into possession of two fruity items this week – a lovely big batch of stewed apples courtesy of my sister, and a tin of strawberries. 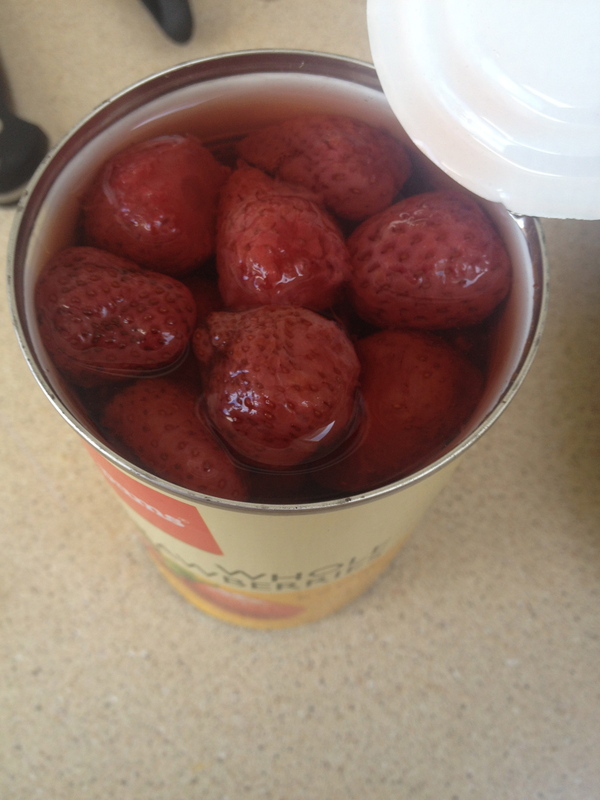 Yes, tinned strawberries, what a strange thing indeed. I found them in the supermarket on special for 99 cents per tin and I figured I was prepared to part with 99 cents to satisfy my curiosity. This, I thought, could either be great or horrible. I find the way they look a little alarming to be honest. I think it’s all that pinkness and bulbousness. When in possession of a large amount of stewed apples and a tinned strawberry curiosity itch, the only appropriate avenue is to consider baking. 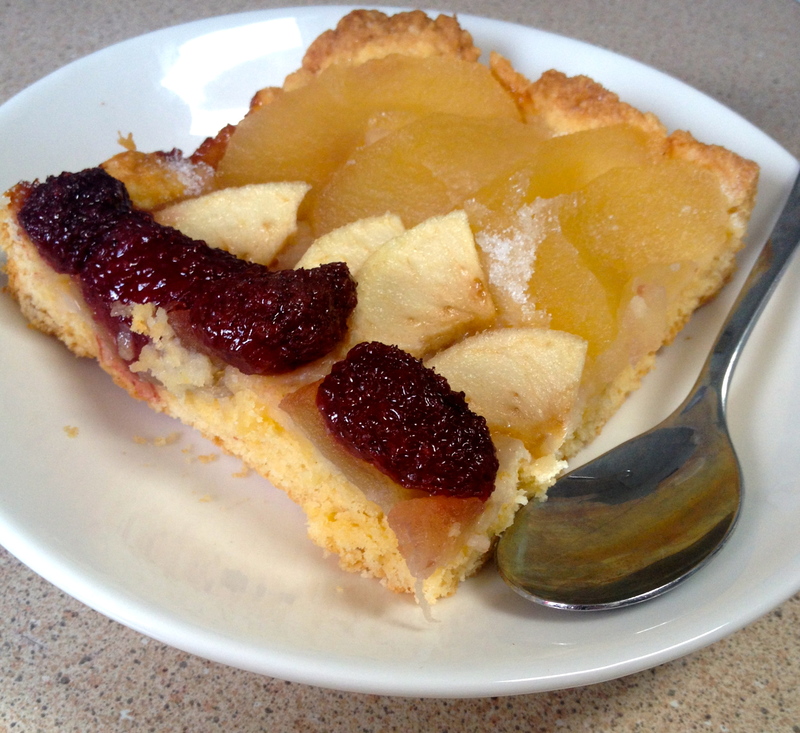 I know strawberries are a summer fruit, and apples an autumn one, but strawberry and apple tart had a nice ring to it. Our current Spring certainly has a very in-between, mixed up feel, so I think playing around with seasonal produce is a fitting response. You may recall that I am fond of Delia for the classics, and her Fastest Blackberry and Apple Tart appealed as a reliable candidate for my meddling. 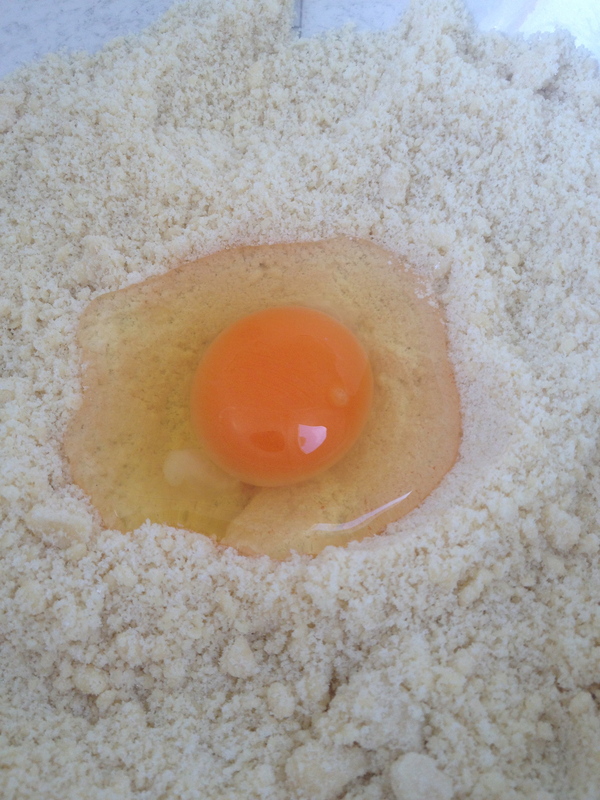 I made the tart base as per instructions, duly sifting rubbing in butter, caster sugar, and making a well for the egg (ooh er, it always feels a bit fancy making a well for the egg). I lined my lightly greased tin with the tart dough and began layering on the stewed apples (a bit of a deviation, as Delia asks for fresh). Being stewed apples, they released a fair bit of liquid into the dough, despite my careful draining. To avoid my tart becoming too sog-tastic, I reverted to Delia’s advice, using fresh apples over about half the tart. Delia instructs that one scatters the fresh blackberries over the apples. My slightly waterlogged strawberries did not appear to me the kind of fruit one blithely ‘scatters.’ And so, I lined them up neatly in between the apples, which also satisfied my neat-freakish tendencies. I sprinkled the tart with one tablespoon of caster sugar as instructed and put it in the oven for 45 minutes at 180 degrees celsius. Although I was concerned the liquid from the stewed apples would result in a soggy base, this did not happen and some of the apple juices pooled and caramelised in the corners of the tart in a most pleasing fashion. But what you really want to know, I am sure, is how the strawberries fared. My dear friend and afternoon tea guest and my husband both gave positive reports and I was pleased too. They held their shape well and combined nicely with the apples and crisp base. 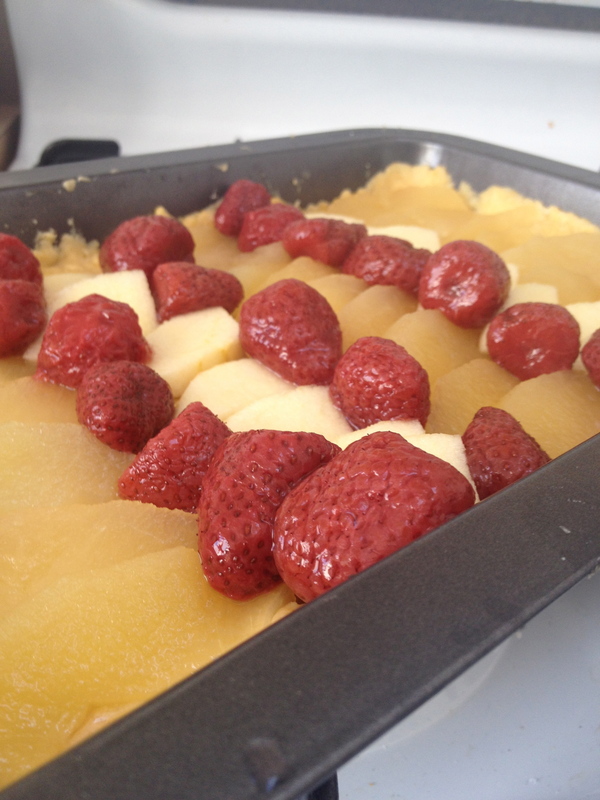 This strawberry and apple tart went down a treat with ice cream, fresh strawberries and a glass of peach juice. 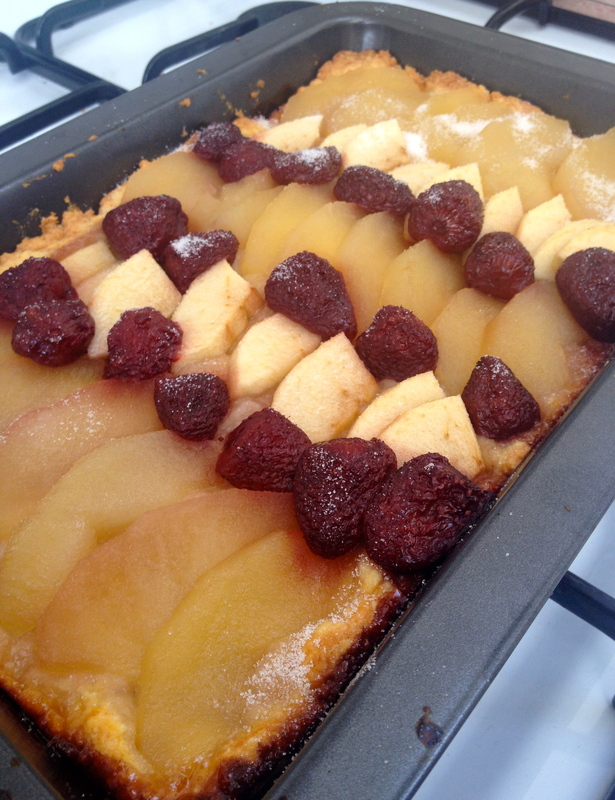 Verdict: would happily make this again, and thumbs up to Delia for the excellent, easy base recipe. And I would happily eat this again! Delialicious. Why thank you Amy! Tasted all the better for eating it in excellent company. Well, all thanks to you for the stewed apples!